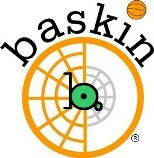 Baskin is a new sport invented in Cremona in 2003 whose objective is to create an activity literally everyone – girls, boys, the able and those with physical or mental challenges to overcome – can participate in and enjoy to the fullest extent of their abilities. The men who came up with baskin are Antonio Bodini, an engineer by profession and father of a disabled daughter and Fausto Capellini, a P.E. teacher at a local junior high school in Cremona. The idea is simple yet ingenious: a sport inspired by basketball but with modified rules that allow anyone to take part in the game in a meaningful way. No longer do people have to adapt to an existing sport but finally we have a sport that is constructed so that it can adapt to the diversity of those taking part. Baskin got off to a slow and difficult start. Initially Antonio, Fausto and a group of kids from the junior high school where he taught began the process by trial and error, modifying the rules, the play area and the objects used based on one imperative – everyone had to participate in a significant way. As time passed baskin began to take shape more and more and other people became interested in the idea. The Cremona Town Council gave the group access to its sports facilities, local sporting organisations in the area started to form their own baskin teams for young people from outside the junior high school system. Baskin has grown and continues to grow because people like it, because everyone has fun playing it and because no-one is ever excluded. The Baskin association was founded in 2006 with a mission is to promote this sport across the country. Baskin in currently being played at provincial and inter-regional levels in most of Italy. 2 risposte a "Baskin: a sport for everyone"
i’m a teacher for physical education in switzerland and curently working on my masterthesis in special need education. I would like to write my thesis about baskin. For this i need more informations and would love to make contact with someone who is involved in the whole development. Where can i find the contacts to one of this people?